Located in Atlantic City, Caesars Atlantic City Resort & Casino is in the entertainment district, within a 5-minute walk of Boardwalk Hall and Pier Shops at Caesars. This 4-star resort is 0.2 mi (0.4 km) from Atlantic City Outlets (The Walk) and 1.3 mi (2.1 km) from Atlantic City Historical Museum. Make yourself at home in one of the 1140 air-conditioned rooms featuring refrigerators and LCD televisions. Wired and wireless Internet access is complimentary, while video-game consoles and cable programming provide entertainment. Bathrooms have complimentary toiletries and hair dryers. Conveniences include phones, as well as safes and desks. Pamper yourself with a visit to the spa, which offers massages, body treatments, and facials. Gambling sorts can try their luck at the casino, while others may prefer an outdoor pool or a spa tub. Additional features at this resort include complimentary wireless Internet access, concierge services, and gift shops/newsstands. 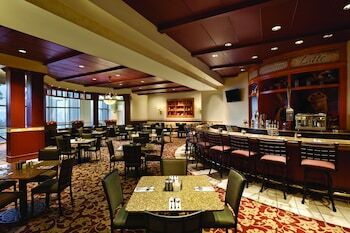 Enjoy fusion cuisine at Palace Court Buffet, one of the resort's 10 restaurants, or stay in and take advantage of the room service (during limited hours). Snacks are also available at the coffee shop/café. Relax with a refreshing drink from the poolside bar or one of the 4 bars/lounges. Full breakfasts are available daily from 7 AM to 1 PM for a fee. The preferred airport for Caesars Atlantic City is Atlantic City, NJ (ACY-Atlantic City Intl.) - 15.7 km / 9.7 mi. The preferred airport for Caesars Atlantic City Resort & Casino is Philadelphia, PA (PHL-Philadelphia Intl.). Free in-room WiFi has a 2-device limit. WiFi access is limited to 2 devices per room, per day.